Excavation and trenching are among the most hazardous construction operations. OSHA defines an excavation as any man-made cut, cavity, trench, or depression in the earth’s surface formed by earth removal. A trench is defined as a narrow underground excavation that is deeper than it is wide, and is no wider than 15 feet (4.5 meters). Cave-ins pose the greatest risk and are much more likely than other excavation-related accidents to result in worker fatalities. Other potential hazards include falls, falling loads, hazardous atmospheres, and incidents involving mobile equipment. 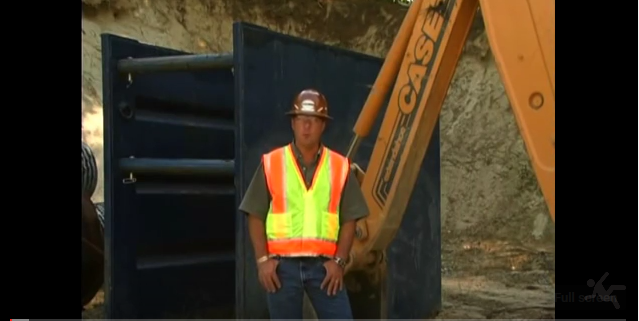 Trench collapses cause dozens of fatalities and hundreds of injuries each year. Do not enter an unprotected trench! Trenches 5 feet (1.5 meters) deep or greater require a protective system unless the excavation is made entirely in stable rock. Trenches 20 feet (6.1 meters) deep or greater require that the protective system is designed by a registered professional engineer or be based on tabulated data prepared and/ or approved by a registered professional engineer. There are different types of protective systems. Sloping involves cutting back the trench wall at an angle inclined away from the excavation. Shoring requires installing aluminum hydraulic or other types of supports to prevent soil movement and cave-ins. Shielding protects workers by using trench boxes or other types of supports to prevent soil cave-ins. Designing a protective system can be complex because you must consider many factors: soil classification, depth of cut, the water content of soil, changes due to weather or climate, surcharge loads (eg., spoil, other materials to be used in the trench) and other operations in the vicinity. OSHA standards require that trenches be inspected daily and as conditions change by a competent person prior to worker entry to ensure elimination of excavation hazards. A competent person is an individual who is capable of identifying existing and predictable hazards or working conditions that are hazardous, unsanitary, or dangerous to employees and who is authorized to take prompt corrective measures to eliminate or control these hazards and conditions. OSHA requires safe access and egress to all excavations, including ladders, steps, ramps, or other safe means of exit for employees working in trench excavations 4 feet (1.22 meters) or deeper. These devices must be located within 25 feet (7.6 meters) of all workers. Keep heavy equipment away from trench edges. Keep surcharge loads at least 2 feet (0.6 meters) from trench edges. Know where underground utilities are located. Test for low oxygen, hazardous fumes, and toxic gases. Inspect trenches at the start of each shift. Inspect trenches following a rainstorm. Do not work under raised loads. NEW Trenching and Excavation Safety (PDF*). 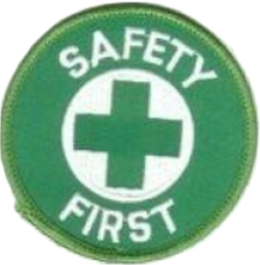 OSHA Publication 2226, (2015). Highlights key elements of the standards and describes safe work practices that can protect workers from cave-ins and other hazards. Trenching and Excavation Safety (PDF*). OSHA Fact Sheet, (2011). A Spanish version (PDF*) is also available. Working Safely in Trenches (PDF*). OSHA QuickCard™, (2011). A Spanish version (PDF*) is also available. Do Not Enter an Unprotected Trench! (PDF*). OSHA Poster, (2011). A Spanish version (PDF*) is also available.